Asero Insurance | Could Your Staff Respond to a Medical Emergency? Home / Uncategorized / Could Your Staff Respond to a Medical Emergency? 55% cannot get first aid or CPR and defibrillator training from their employer. And even if employers do offer this training, it’s often either one or the other. 50% cannot locate the defibrillator at work. In the hospitality industry, that number rises to 66%. 33% of safety managers said that first aid, CPR and defibrillator training only became important and was offered after an incident demonstrated the need. 33% of safety managers said lives had been saved at home and at the workplace as a result of training provided at work. 75% of safety managers said injuries or medical conditions had been treated in the workplace with this training. 36% of safety managers felt it would be valuable to offer training more frequently than every two years (the current requirement). While OSHA does not require that you have someone on staff who knows CPR and how to use a defibrillator, having someone skilled in those areas is a good idea. For many industries, OSHA recommends CPR and defibrillator training as a best practice but doesn’t require it, except for a few high-hazard industries. The AHA recommends that all employers offer first aid, CPR and defibrillator training because it can save lives. If someone suffers a heart attack at work they have only a 5 to 7% chance of surviving while waiting for emergency medical services to arrive. Workers who receive immediate defibrillation, however, have up to a 60% survival rate one year after cardiac arrest, according to the AHA. Safety experts recommend having at least one person on every shift that is trained in CPR and how to use a defibrillator. In fact, the more employees who are trained, the better. All employees should know who on staff is trained so they can fetch them in case of an emergency. 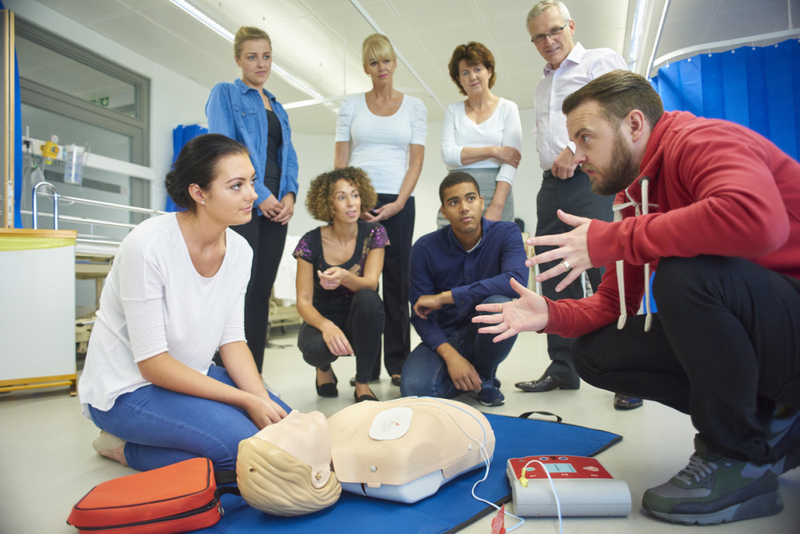 The best approach is to have a full staff training on first aid, CPR and use of defibrillator, which you should consider keeping in your office. Everyone in the office should know where the nearest defibrillator is located. It should be in a conspicuous place, like hanging on a wall.